The successive races who have lived and intermarried have helped, with their various tastes and customs, influence the Tunisian cuisine. The Tunisian gastronomy is the result of rare combinations mixing local know-how and the contributions of various origins at various times. 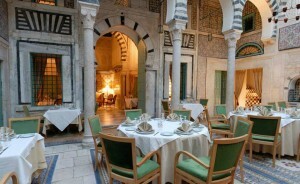 The Tunisian cuisine was enriched throughout the centuries by the contributions of the people who came in the country. For example, the Jewish community’s impact is very significant as were the Berbers who brought couscous to Tunisia. Tunisian cuisine is based on olive oil and spices whose suitable mixture and erudite proportioning achieved miracles, transforming simple and inexpensive products into refined dishes. Like all Mediterranean countries, Tunisian cuisine depends not only on olive oil, spices and tomatoes but also on a great assortment of fishes and meats. 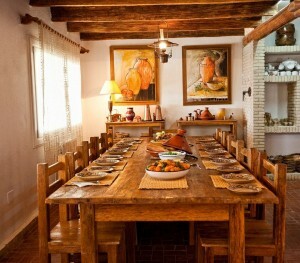 It draws its inspiration from various sources particularly Berber, Arab, Turkish and even Italian. 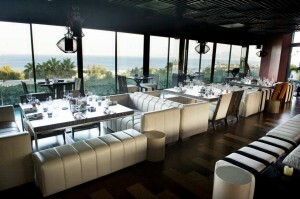 The modern Tunisian gastronomy offers a wide choice of hors d’oeuvre. The most popular is the famous “brik a l’oeuf“ and tuna: It consists of triangular shaped pastry which is stuffed with tuna, herbs, an egg and fried in oil. One finds them in the menu at every gargote. If the pastry is too thick, the Brik becomes brick and the point is lost. There are also various salads containing vegetables like the salad méchouia or meats like the salad of octopuses. Like all Mediterranean people, the Tunisians love to nibble at a selection of appetizing bits and pieces as soon as they sit at the table. In Greece, Turkey or Lebanon, it is called the Mezze, here Kemia, and it is this course that whets the appetite and begins the conversation around the table: tiny octopus, clams, pimentos, olives, harissa, the national hot sauce, tuna, merguez (a sausage of beef or lamb grilled over charcoal). There is a great variety of soups from vegetable soups to fish or lamb soups. 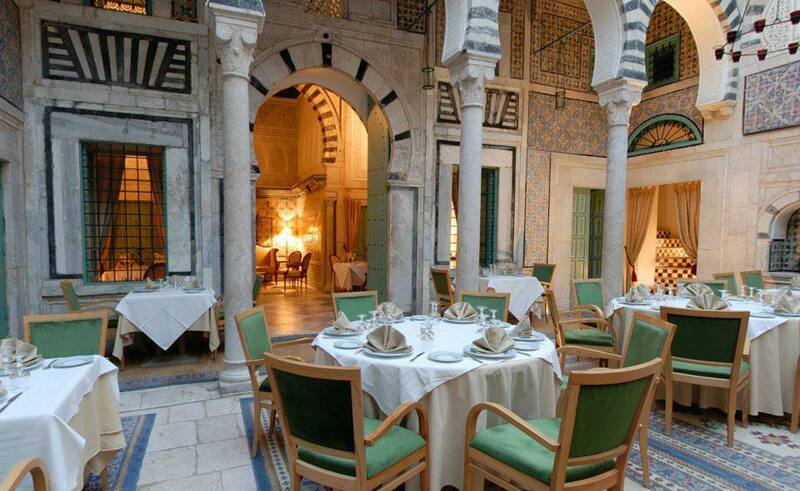 With this great diversity, each area adds particular components: in Tunis, it is specific hors d’oeuvres like Brik Danouni. The typical dish in Sfax is the fish soup. 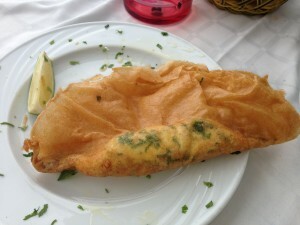 Djerba’s speciality is a preparation of rice a la jerbienne. In rural areas, one still appreciates a multitude of very simple primitive preparations, often based on home made bread and harissa, the Tunisian national spicy sauce. Tunisian’s appetizers also include Home pressed olive oil, few green olives, country bread, heavy and grainy and a salad of sliced scarlet radishes or plump tomatoes served with grilled fish. A favorite way to prepare young lamb is coucha – portions of shoulder meat are rubbed with a sauce of olive oil, salt, a sprig of mint, a touch of cayenne pepper and turmeric and baked in a slow oven in a tightly covered earthenware dish. Ragout sauces are innumerable. It basically consists of a sauce containing tomatoes raised with various spices. From this sauce one can prepare an infinity of dishes whose diversity comes from the mode of preparation but especially from the composition. The tajines are pies that are prepared with vegetables or meat. Fish is variously prepared from simple grilling to the most elaborate preparation. Pampered by miles of coast and a unpolluted and generous sea, seafood is a mainstay of the Tunisia diet. Without question, the blue ribbon goes to the Rouget -red mullet, a delicious fish either grilled or fried . The varieties of seafood from the imperial royal shrimp to the familiar and much appreciated sardine are endless and each region has its recipes and secrets for preparation. Jerba in particular is known for the excellence of these gifts of the sea. The national dish remains obviously the couscous. It is a semolina cooked with the vapor and sprinkled, after cooking with a sauce. The seeds can be large, average or fine. It is specifically the sauce which, by its contents, makes the infinite variety of the couscous: vegetables, fish, octopuses, lamb, beef, chicken… Among the other dishes that you are most likely to come across is the chakchouka, a ratatouille of fresh tomatoes, pimentos and onions and the koucha, shoulder of meat with whole chilis and potatoes cooked in the oven… For desserts, fruits are preferred to creams and ice creams. Tunisia is well reknown for the quality and sweetness of its fruits. 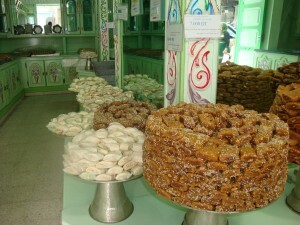 Also traditional pastry made of almonds, nuts and dates is traditionally prepared. Sweet loving Tunisians have adopted the Turkish baklava – layers of whisper thin pastry interspersed with ground pine nuts, almonds, hazelnuts and pistachios, bathed in golden butter, baked and dipped in a honey syrup. No holiday, wedding, christening or dinner party could be considered without it. Sweet loving Tunisians have adopted the Turkish baklava – layers of whisper thin pastry interspersed with ground pine nuts, almonds, hazelnuts and pistachios, bathed in golden butter, baked and dipped in a honey syrup. No holiday, wedding, christening or dinner party could be considered without it. Other sweets, makroudh ,a specialty of Kairouan of semolina pastry stuffed with dates, caak, almond paste wrapped in fine dough ,as well as a myriad of regional specialties make up the traditional platter served for every joyous occasion. The vast almond orchards of Sfax supply the different types of almonds that are the basic ingredient of most sweets and cakes. Tunisian pastries are given as gifts for holidays and are well worth a trip to the nearest pastry shop. As for drinks, mint tea is traditionally served in Moorish cafes. Tunisian wines cover a wide range of reds, whites, roses and muscatels. The art of vine growing and winemaking dates back to the earliest antiquity. The agronomist Magon, who lived in Carthage at the time of the Phoenicians, recorded in his Treatise of Agronomy viticulture, wine-producing practices that are still in use nowadays. In the Roman mosaics, Dionysos-Bacchus, the god and guardian of wine, contributes to ride high in triumph.Today, Tunisian wine continues to boast the high repute that the sun, soil and time-honored Tunisian traditions have conferred on it. Tunisian meals are social events and the longer the better. PromoTunisia will take you to the local gargotes where local food has both taste and character or organize picnics for lunches and will invite you to fully appreciate the Tunisian gastronomy in the best restaurants for dinner. It will go further and make you discover the ritual attached to this cuisine and allow you the unique experience to participate at the elaboration of one of your dinner A typical meal would begin with shorba frik- lamb soup with flavored with tomato paste, coriander, parsley and seasonings in which green spring wheat grains are slowly simmered, is served with slices of lemon. Brik, followed by Slata mechouia – grilled green peppers , tomatoes and garlic finely chopped .Spices and olive oil are added and the salad is garnished with tuna fish, hard eggs, olives and capers. Dinner will now begin. Assorted stews follow roasts of lamb, veal or fish, tajine – a rich, flavorsome omelet baked with chopped meat, vegetables and cheese. Fresh salad, fruits, pastries and custards, coffee and tea make the finale. While most Tunisians like their food hot and spicy, restaurants and hotels prepare their menus considering the tastes of their visitors and serve harissa separately. This condiment is made of crushed dried red peppers, garlic and spices and adds a definite zest to any meal. It is a mainstay of many dishes and can be toned down by a touch of olive oil.